It may be an exercise in hyperbole to refer to our no. 2 prospect as a “post-hype sleeper” (especially since he’s been our no. 1 prospect the past two years), but in an industry always on the lookout for the next new hotness, Buxton qualifies as old news. It doesn’t help his Q rating (or for the millennials reading, his Klout score) that he missed most of 2014 with a wrist injury and then a concussion, or that he looked overmatched at times in his first taste of the majors this past season. But as the old scouting adage goes, “tools play,” and Buxton’s selection rivals your local Ace Hardware. He may not be the next Andre Dawson as we opined in 2013, but the first Byron Buxton still looks like an impact major leaguer. Rather than jumping on the Maybe He’s Mike Trout express, BP suggested Buxton might fall short of Andre Dawson level. That kind of levelheaded optimism was warranted, but Buxton followed it with a truly dreadful April that resulted in another tour of the minors. In 49 plate appearances for the Twins, he hit .156/.208/.289 (27 wRC+). Even with great wheels and good defense, you can’t have a 27 wRC+ in the majors unless you can also throw a slider for strikes. Dispassionate observers probably still weren’t worried, but at that point Buxton had lost almost a full season to injury and had looked terrible in his first few shots in the majors. He was still young and talented, but it wasn’t going well. Buxton returned to the majors on May 31 after tearing up Triple-A and proceeded to offer another dreadful 106 PAs. 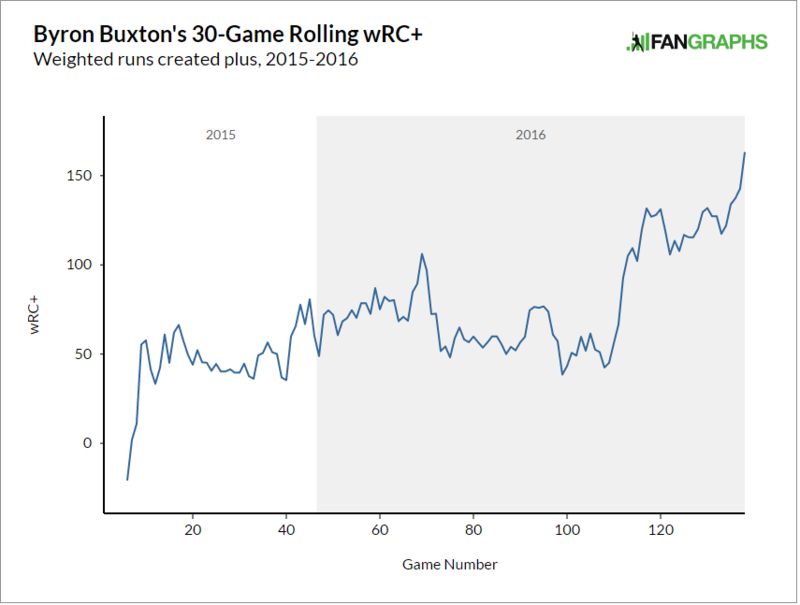 From May 31 through July 2, Buxton hit .222/.248/.374 (58 wRC+). If you’re not doing the math in your head, that comes to a 50 wRC+ over his first 293 PA from 2015 to July 2, 2016. He showed below-average power and virtually no control of the zone. In fact, Buxton spent time on the DL and in the minors in August, so if you look only at his September/October numbers, you find a .287/.357/.653 (165 wRC+) line in 113 PA. It’s all small-sample data, but the most recent chunk of games is as impressive as the early chunk was disappointing. 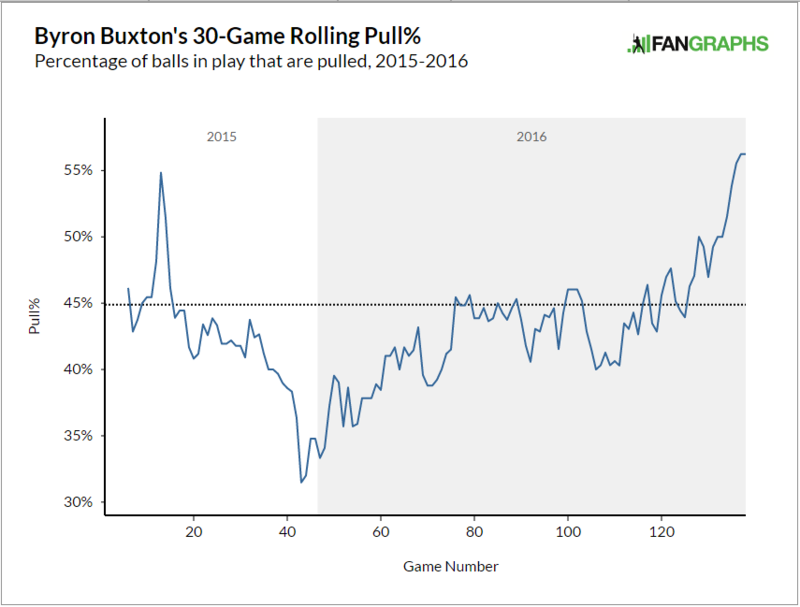 And again, while we’re dealing with very noisy data, it’s hard to ignore this as a matter of first impression: Buxton pulled the ball a lot more late last year. This development is consistent with more power, which is a big part of why his numbers looked so much better down the stretch. The data reveal other positive developments, as well. Consider: prior to September 1, 2016, Statcast had tracked 168 batted balls in Buxton’s career, over which he averaged an 88.4 mph exit velocity. For the 53 balls tracked after September 1 of last year, that number was 91.9 mph. That’s not enough information to dramatically shift your opinion, but it’s consistent with the same general observation that Buxton was making more authoritative contact late last year. I think most informed baseball observers and practitioners still have a relatively high opinion of Buxton. You won’t hear any Trout comps — and, to be honest, the ones we heard in 2013 were probably unfair — but if there were a prospect ranking in 2017 for guys who just lost their prospect status, I would suspect Buxton would be near the top of the list. But there is definitely some shine off his apple independent of the Trout comps given his early MLB struggles, and I think that might just be a little unfair. In a world where Buxton was a top-20 prospect instead of a top-two prospect, or a world in which no one ranked prospects in numerical order, it’s totally plausible that Buxton’s first MLB reps might not have taken place until last last year. Buxton tore up Single-A in 2013, but he missed a ton of time in 2014 with injuries. Other than his two-week stint in the majors in June 2015, Buxton had recorded just 59 plate appearances above Double-A when he was called up in late August of that year. And even in 2016, Buxton had only 209 PA in Triple-A. Phrased differently, Buxton had compiled only 271 PA at Double-A and 268 PA at Triple-A in his entire career. Combined, that’s not even a full season of plate appearances in the minors above A-ball. Buxton is incredibly talented. That’s obvious to anyone to watches him run or taking batting practice. He’s a gifted individual with a ton of potential, but the Twins offered him very little developmental time and pushed him into major-league games well ahead of the point at which he was probably ready. That’s something they probably wouldn’t have done with even a slightly worse prospect. There’s a world where he spends most of 2015 in Double-A and gets a few late season chances at Triple-A. Then he spends most of 2016 in Triple-A and gets his first major-league time last September. In that world, Buxton likely ranks first or second on 2017’s prospect lists and heads into his age-23 season as a superstar-in-waiting. Perhaps the Twins’ desire to rush him to the majors has cost him some potential, but it’s also reasonable to think he’s capable of developing even in adverse conditions. If that’s the case, the Buxton we saw down the stretch might be the Buxton we will get when the games begin in earnest in April. We’re living in a golden age of young players, but we shouldn’t cast aside players who don’t bloom immediately. Buxton is still incredibly young and has been given precious little time to find his footing, even though it seems like he’s been around forever. Interestingly, the FanGraphs audience has picked up on this. Buxton’s FANS projection is much higher than the one offered by Steamer and ZiPS. Steamer has his wOBA at .304. ZiPS says .322. The FANS think .344, as of Sunday. If you run a quick comparison between our blender Steamer/ZiPS and the FANS, you find that the FANS are only more bullish on seven players relative to the blend. The crowd doesn’t think Buxton is going to be an elite hitter in 2017, but it does appear to be more open to the idea that Buxton isn’t the player he was for his first 300 PA. If the crowd is right and Buxton combines a .340 wOBA with great defense and base running, the Twins won’t have their own version of Mike Trout, but they might actually have themselves an Andre Dawson. We hoped you liked reading The Top Prospect Who Technically Isn’t by Neil Weinberg! Can Baseball Solve the “Yips”? I have followed Byron Buxton from a unique perspective. I was sitting in my usual seat at New Britain Stadium, Section 208, Row 8, Seat 16 on that fateful night in August, 2014. Byron Buxton, the next Willie, was playing in his first game in Double-A, but it was not going well for him. In his three PA’s he got barely a foul tip and fanned each time. Then came the top of the 7th. A sharply hit line drive was hit into the gap in right-center and, from my seat which was directly in line with the batted ball, I watched as Buxton and the Rock Cats RF, Mike Kvasnicka converged on the ball, then it happened. I have seen many collisions, Mike Cameron and Carlos Beltran, comes to mind immediately, but this one was different, more violent. Buxton went down instantly and didn’t move, and didn’t move. He lay on the ground for 20 minutes while the medical personnel did their job. I never leave a game before the last out, but I did that night, because I was convinced, in my own mind, that he had broken his neck. It must be said that he had not torn up Fort Myers, as had been predicted, but the Florida State League isn’t the California League. How much impact did this devastating trauma have? It is impossible to ever know. Ever since then I have followed his career with great interest. A trip to Citi Field is an ordeal but the Twins were coming and I got a pair of great tickets and, on 9/17/2016, I watched him hit a mammoth HR. I watched Willie from his first game and one-half of Buxton’s game comes about as close to Willie as anyone could and I hope to see the bat come around. I was at that game as well. In fact, it remains the only minor league game I’ve ever seen in person. Like you, I thought he may well have broken his neck. I’ve never seen a player down that long (was it really only 20 minutes? I was sure it had to be a half hour at least by the time the ambulance finally rolled him out, but I wasn’t following the clock). What a relief that he had “only” a severe concussion. And those three plate appearances… I had a colleague, only a casual baseball fan, to whom I pointed out that “that guy is the number one prospect in baseball by many accounts” who could not get over how feeble he looked during those three strikeouts. And those were indeed some awful looking ABs, although admittedly it was his very first game at AA. It’s a hard game, and he’s come a long way. Your recollections fit exactly with mine. The only reason I said 20 minutes is that was what I read afterwards. It seemed like an eternity and I was too emotional to worry about that. The news that he avoided serious injury was, as you say, a great relief. Your comments about the AB’s are also right in line with mine because I was also taken aback by just how bad he looked.